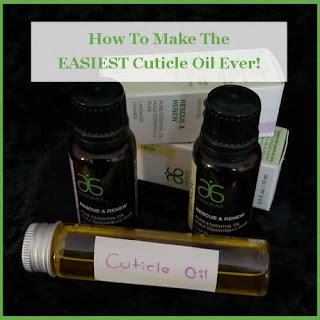 Today I'm going to review how to make the easiest cuticle oil ever. 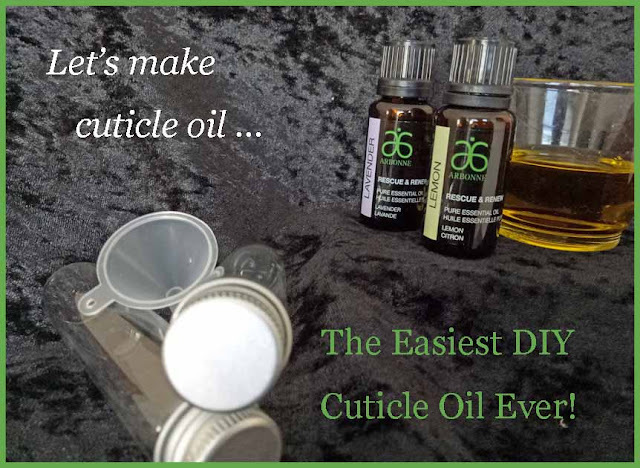 Once you see how easy it is you'll wonder why you haven't always made your own DIY cuticle oil! This year I've decided to treat myself my getting my nails done once a month (well it's about every three weeks, but my husband thinks it's a monthly thing LOL!) and I do love it when they pop on the cuticle oil at the end. My cuticles are looking much better, but they would look even better if I used it a little bit more often. There are so many recipes for DIY cuticle oil that they would make your head spin, but many of them used so many ingredients that it just seem such an effort. Using sweet almond oil, jojoba oil, vitamin E oil and about 5 different essential oils just seemed a lot for me to recommend to people, after all we don't have all these ingredients just lying around the house do we? 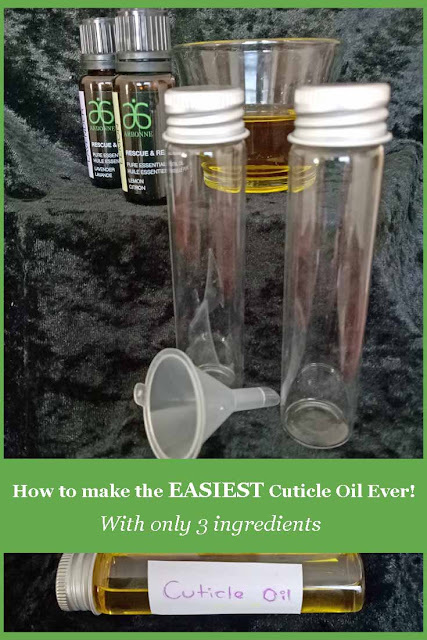 Easy DIY Cuticle Oil That Your Nails Will Love! 2 drops pure lavender essential oil. Simply mix the ingredients together and keep in a bottle, I recommend seeing if you can find a nail polish style of bottle with a nail polish brush to keep it in (they didn't have any at my local store) or even a roller bottle. These type of bottles will made it easier to apply, but aren't essential. As you can see from my photo I just used a test tube style bottle (as I had it on hand) and I use a Q-tip to add the oil around my nails. I will let you know, however, that I have some roller bottles on order. Lemon oil is fantastic for softening hard skin which is why it's a perfect addition to a cuticle oil. 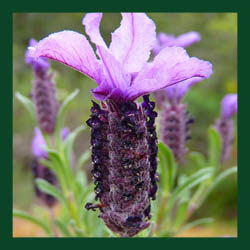 Lavender oil is a very nourishing oil, softening and just great for skin. The combination of these two oils works fantastically to help keep your cuticles looking fabulous and as an added bonus, using a cuticle oil after a manicure actually helps it stay looking beautiful for longer something I've only just found out! EXTRA TIP - if you take vitamin E capsules then simple pierce one of them and squeeze the contents into the cuticle oil. It will make the oil even more moisturizing and rich (a much cheaper alternative to adding vitamin E oil!). It's very important that you use pure essential oils and not synthetic ones when making your own skincare as each essential oil brings it's own benefits and fragrant oils don't have these benefits. I love to use Arbonne's essential oils when available, if I'm after an oil that they don't have then I make sure that the one I buy is 100% pure essential oil. Aromatherapy Isn't Just About DIY Skincare! Aromatherapy has proven to be very successful at helping to relieve stress, simply by using certain essential oils stress and conditions caused by stress can be alleveiated. 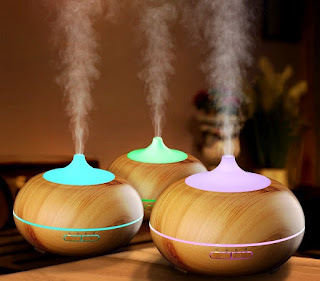 Using essential oils in a humidifier or diffuser can add a lovely atmosphere to a room as essential oils can really help to work on your emotions from relaxing you or making you more upbeat. 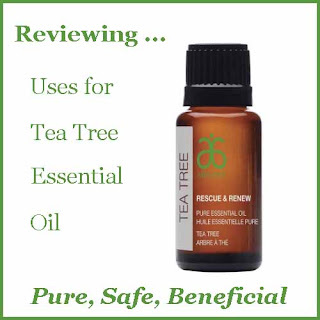 The herbaceous fragrance of tea tree doesn't begin to hint at how many uses there are for this essential oil from medicinal to beauty to household uses this is one very versatile essential oil. It's time for a DIY project for the true romantics out there. 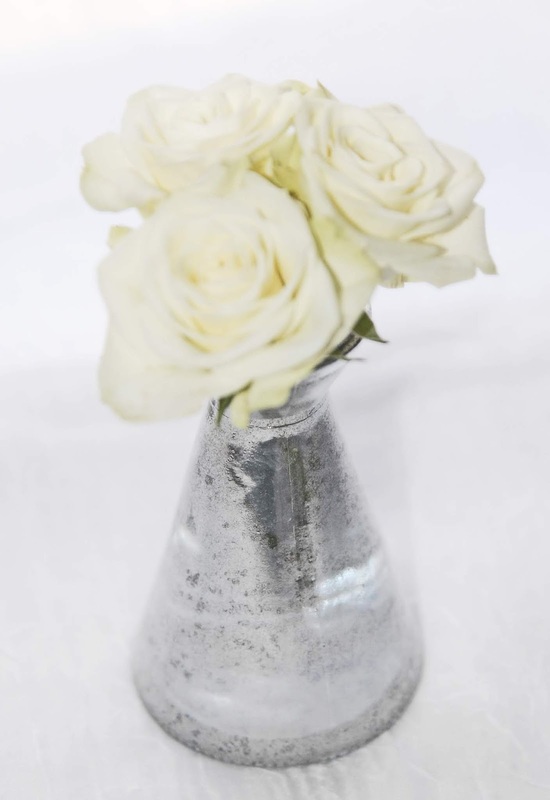 Is there anything lovelier than fresh cut flowers in an antiqued mercury glass vase? 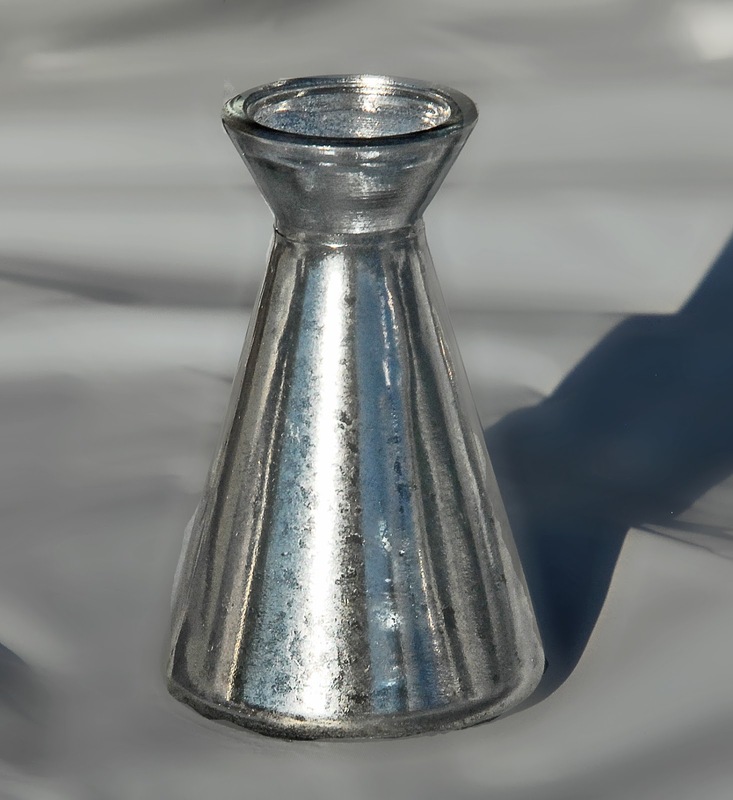 Perhaps the reason mercury glass is such a popular centerpiece at weddings is the nostalgic effect it has on us. I absolutely love the understated beauty and elegance of silvered glass. The look, and the effect, is way too wonderful to save only for special occasions. I invite you to follow along with me and transform your own gorgeous flower vessels. 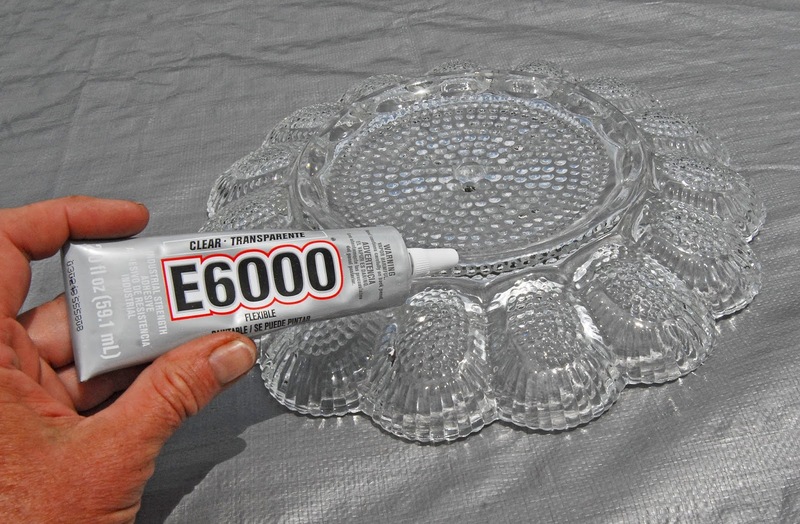 It takes very little time and money to create the beautiful mercury glass effect presented here. In less than an hour, you can be enjoying your own timeless centerpiece. 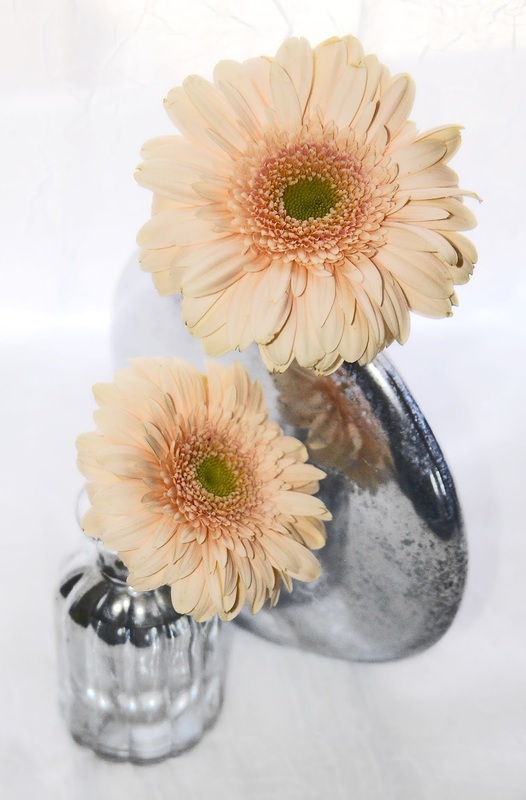 If you're like me, you'll get hooked and create any number of these mercury glass vases for yourself and for gifting to friends and family. This is a gift you can be sure will be used and appreciated. 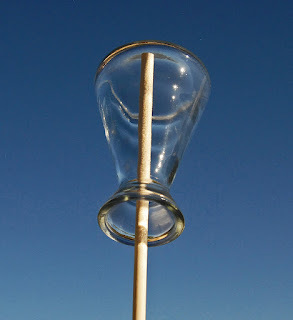 Mix one cup of white vinegar with one cup of water. Pour into misting bottle. 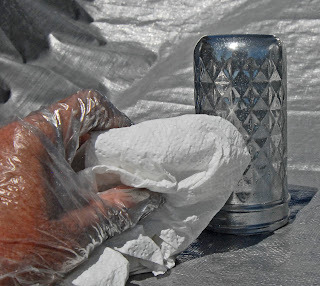 Use a paper towel or soft cloth to wipe your glass clean. Protect work surfaces with a tarp, newspapers, or a drop cloth. Test mister to ensure you will get a very fine spray. 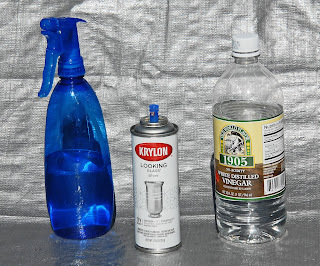 Shake up your spray paint for two minutes. 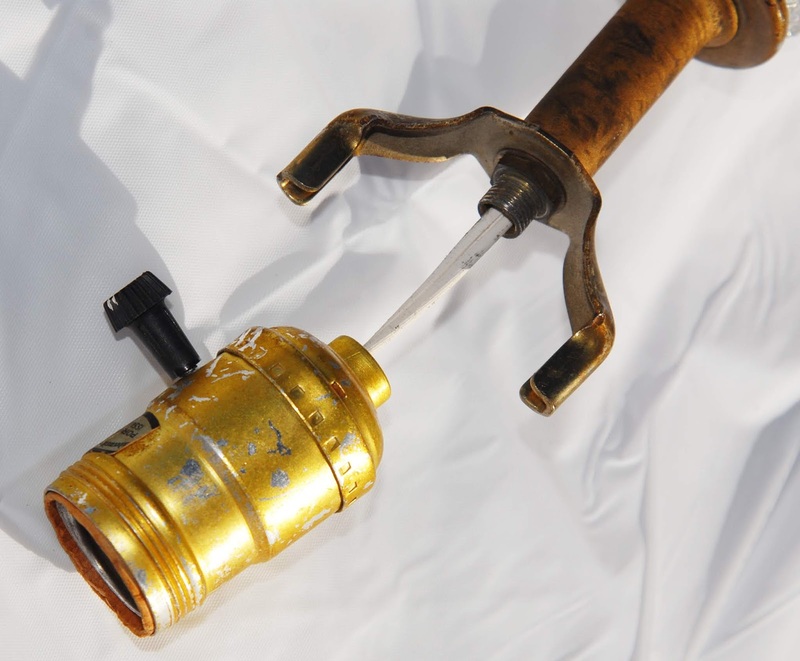 Depending on the type of glass container you are painting, you may find it very helpful to use a dowel rod. Supporting your vase with a dowel makes it easy to mist and spray all of the surfaces at the same time (without getting paint on your hands or fingerprints on your vase). 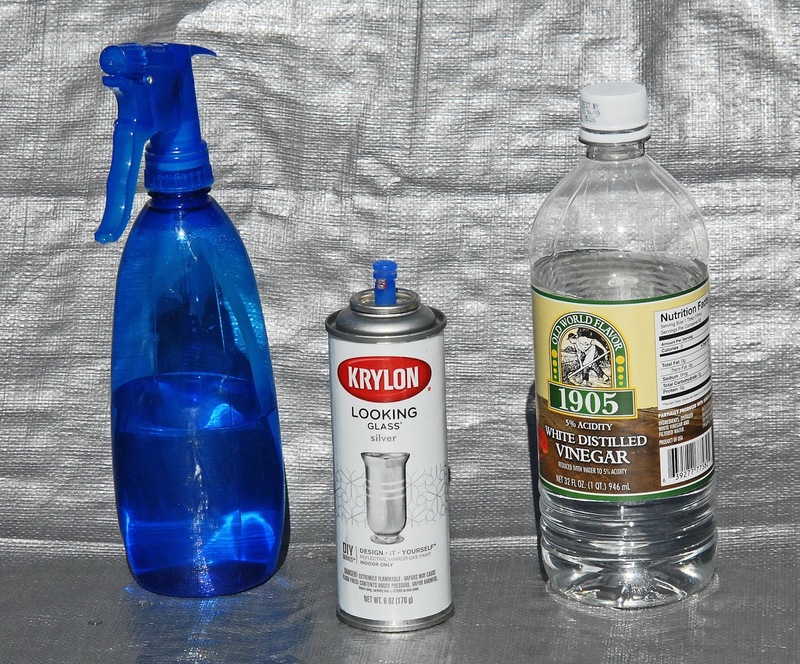 It also enables you to spray the bottom of the vase without waiting for the paint to dry on the sides of the container. When I was painting the test tube vases, I used short dowel rods that I stood on end in an old piece of wood. All I did was drill some holes in a two-by-four. Then, I stacked each test tube on a dowel, leaving enough space in between to give me room to maneuver with the mister and spray paint. 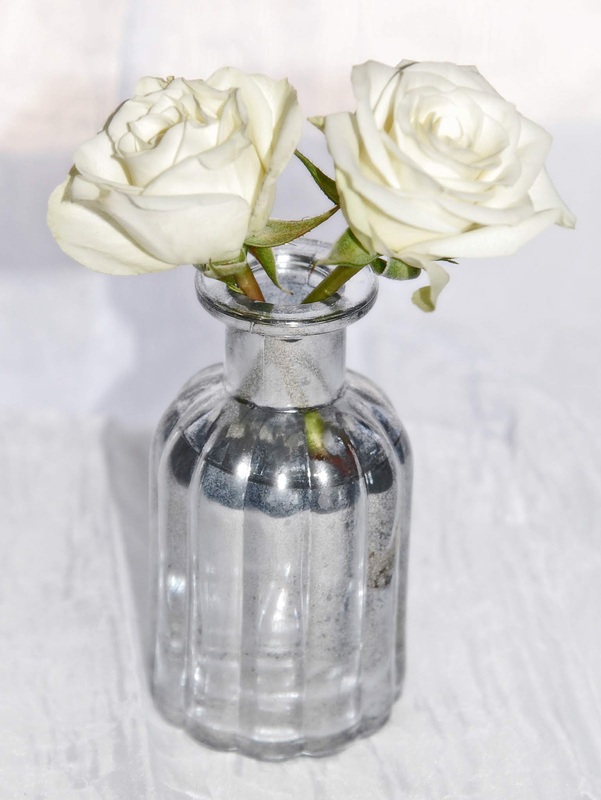 Spray a very fine mist of the vinegar water on your vase. The key to success is to start with a very light coating of the mist. If you get large, running droplets, go ahead and wipe it down with a paper towel and start again. Immediately spray over the mist with a light coat of the Looking Glass spray paint. You will repeat these steps two to three times, so it is important not to try to get all of the silvering done all at once. 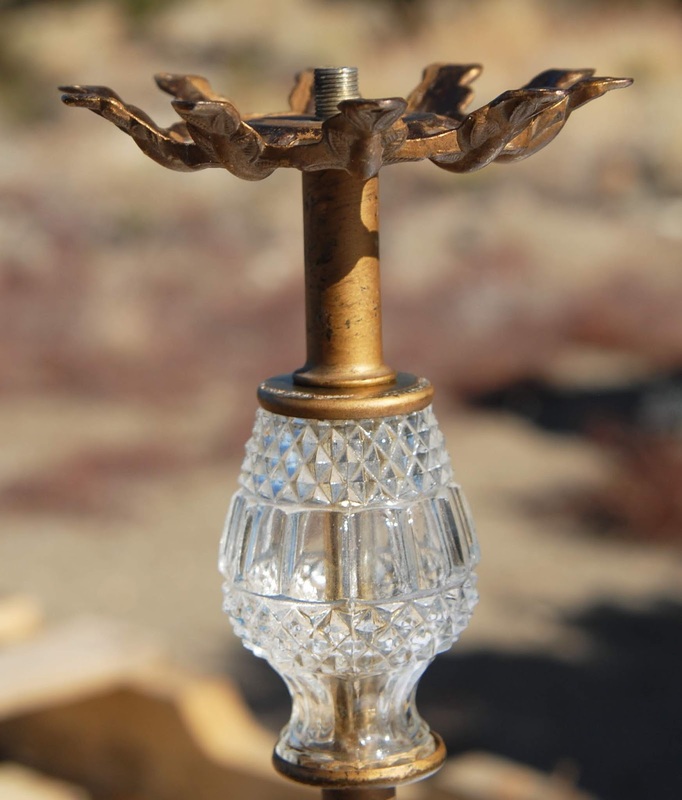 Light layering is essential to getting the desired vintage look of mercury glass. 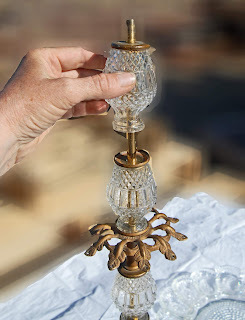 Very gently dab all over the misted and painted surface of the glass with a clean and dry paper towel. You want to blot up all spots of water and any larger droplets of paint. This step creates the aged look of the silvered glass. Repeat the misting, painting, and blotting process until you are happy with the final effect. I repeated the process three times on the vases pictured in this tutorial. Once the paint is dry, experiment with arranging your favorite flowers in your gorgeous mercury glass vases. They look really nice in groupings of various sizes and shapes. 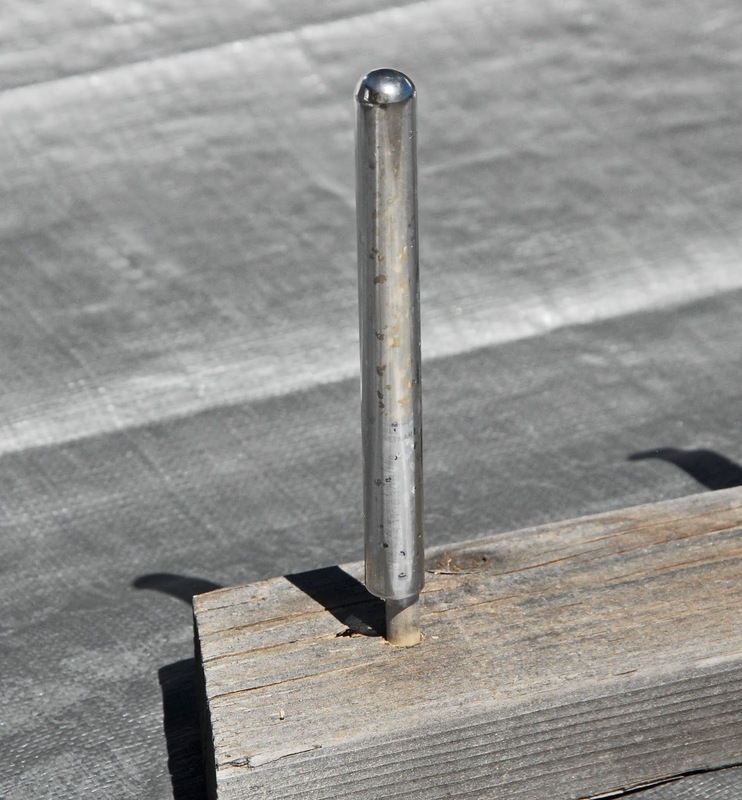 In this example, I placed three mercury glass test tubes in an antique bed spring. The addition of a beveled mirror base created stability and an interesting reflective quality. 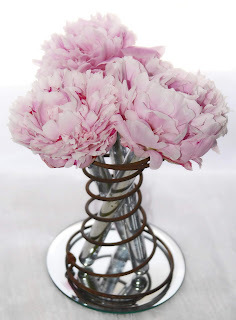 Peonies seemed just right for this type of vintage floral arrangement. Mercury glass centerpieces don't have to be expensive to look like you spent big bucks at a floral shop. Use the glass you already have at home. It is so easy to upcycle any ordinary jar or cheap vase into something extraordinary. There is something incredibly satisfying about giving a face-lift to a common, plain item. We all hold the power of transformation in our hands. Let's go create and share some beauty today. I was visiting my muse the other day, Pinterest, when I came upon the most delightful inspiration. 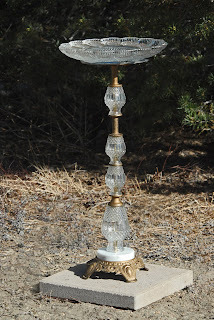 Have you seen the creative bird baths that are being made from vintage lamps? I'm pretty sure I would never have thought of this fun, and ingenious, idea on my own. As one who loves to give cast off items new life, this was the perfect project for me. In case you also enjoy whimsical garden features, I am sharing my DIY process to prime your pump. 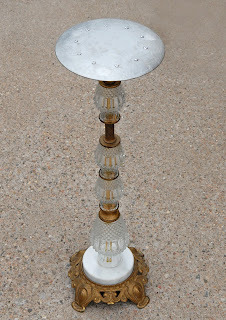 First, I needed an old lamp and bird bath basin, so I took a little field trip to a couple of thrift stores. Goodwill had exactly what I needed. 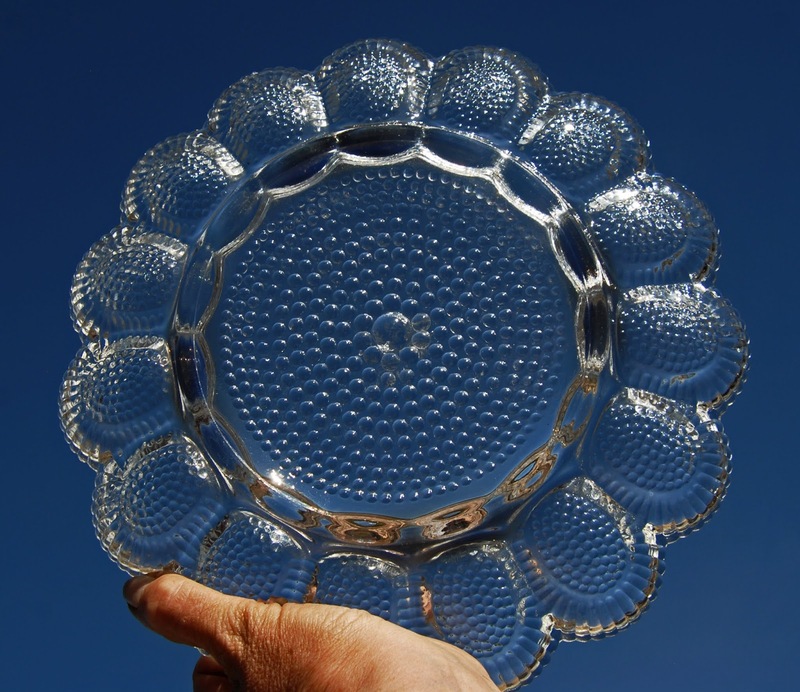 On my first shopping expedition, I found a glass serving dish that reminded me of a sunflower. Amazingly, that is the exact vision I had for the theme of my creation. Who knew an egg platter could be so lovely? 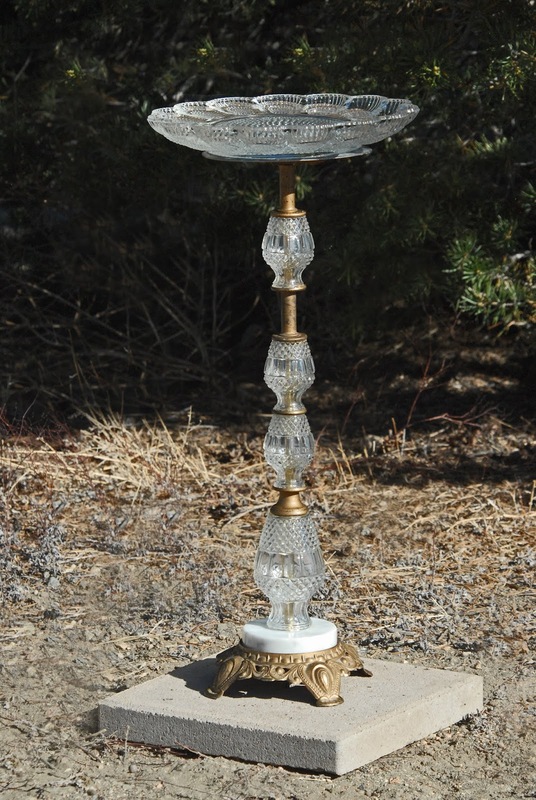 Next, I went on the hunt for the right lamp to complement my new bird bath dish, and to serve as its base. Because thrift stores are always receiving new donations, I found the perfect lamp on my very next trip to the store. 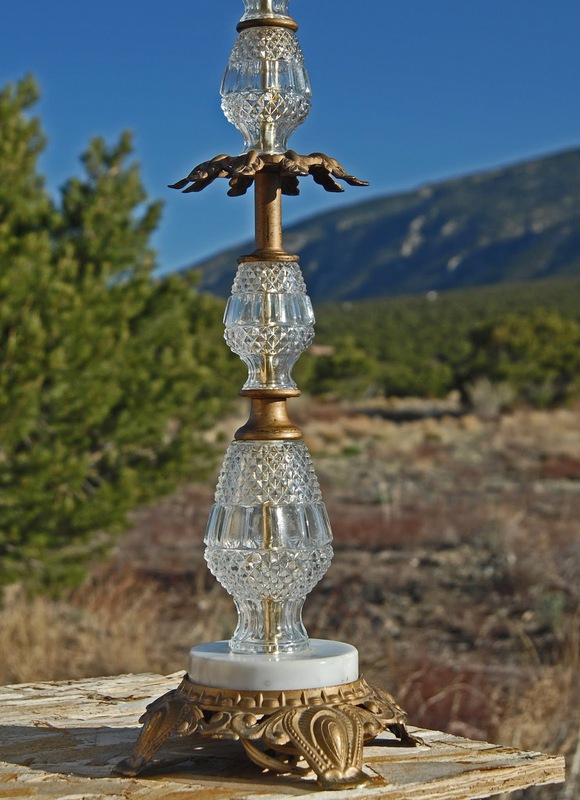 The crystal, marble, and brass features, along with the size of the lamp, were just right in every way. 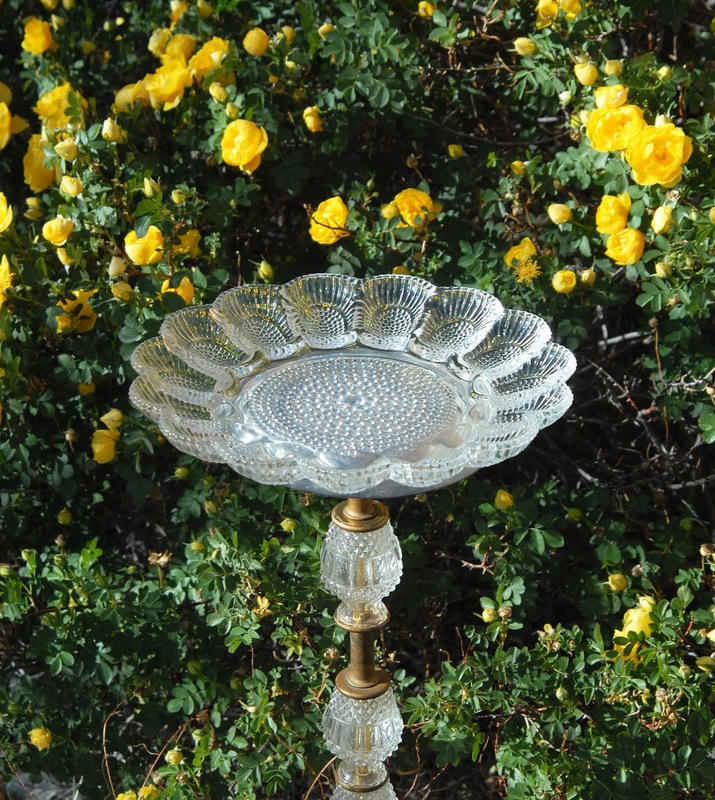 I couldn't wait to get home and put the finishing touches on my vintage bird bath. Step One: Unscrew the light socket and remove it from the top of the lamp. 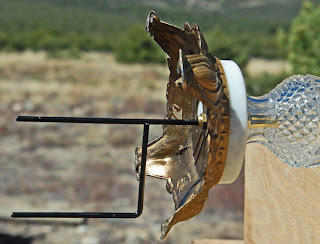 Step Two: Clip the electrical cord and pull it out through the lamp base. Step Three: I removed each individual section of the lamp and reassembled the pieces to better support the basin section of my bird bath. I moved the brass leaf section to the top of the column and reversed it (turned it upside down) to serve as the support arms for my glass dish. 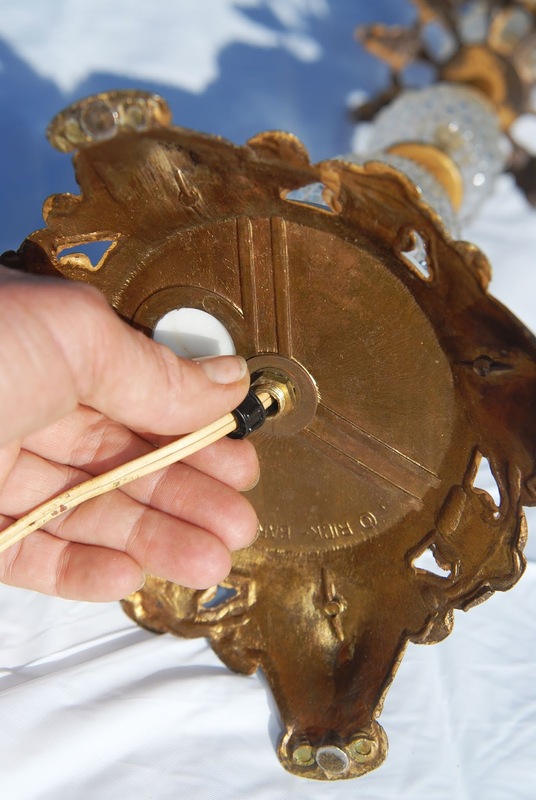 Step Four: Though I had intended to glue the platter directly to the brass arms, I found that they weren't totally level, so I riveted a circular metal candle holder to the brass piece. I spray painted the metal silver since it would show through the bottom of the water basin. I wanted a natural looking reflection. Step Five: I used E6000 glue to affix the glass dish to the candle holder. 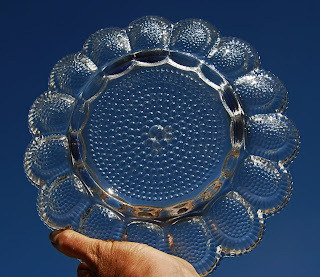 I ran a bead of glue all along the circular rim on the bottom of the egg platter and carefully applied pressure for a minute or two after centering the dish on the metal plate. Then, I let the glue cure for a couple of days. Step Six: Since I don't want my glass bird bath to tip over and shatter, I ran a metal post up into the center column where the cord used to be housed. I purchased an inexpensive plant hanger at the dollar store. It has stakes to anchor the base of the lamp into the ground. 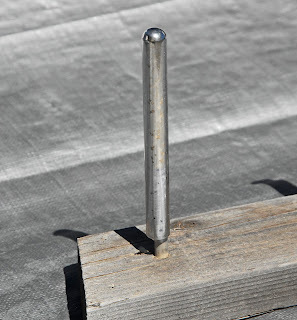 I measured the height of the lamp and then cut off the hook top of the planter stake. 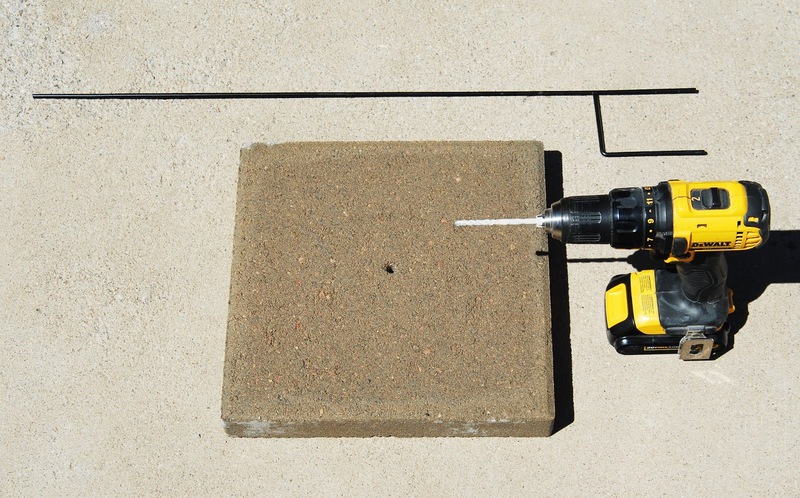 For extra insurance, since the winds are often incredibly strong where I live, I drilled a hole through the center of a cement patio paver and inserted the metal rod through it before installing the rod inside the lamp. Now my bird bath is very stable and far less likely to get knocked over by the wind or wild critters. As a bonus, it now has a level platform on which to stand. I'll be planting flowers around the paver to make it more attractive. 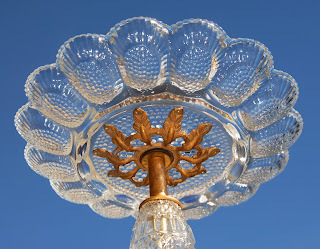 Your steps may not be identical to mine, because every lamp is slightly different, but there are enough similarities to give you a sense of how to go about assembling your bird bath. You may be able to find a lamp that already has a glass shade. In that case, you won't need a separate glass dish. I preferred knowing that my glass dish would not be toxic to birds and I didn't have to seal any holes that had been drilled through a lamp shade. I am very pleased with my unique bird bath. It is so satisfying to take an unwanted item or two and turn them into a conversation piece. More than that, I feel like I am showing a little love to the beautiful creatures who share my garden habitat. It has been an especially dry season. With the mountain creek dried up at the moment, it feels wonderful to provide a source of sustenance for the precious birds that fill my life with their sweet presence and songs. 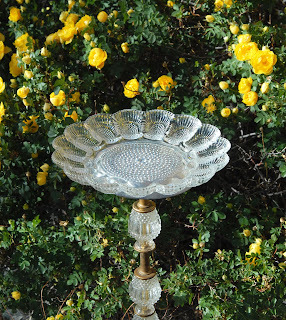 Let me know if you decide to make your own bird bath or garden art with a vintage lamp. I would love to see how you use your creative gifts. One of the gifts that I just received for Christmas was the book Social Media For Writers. My daughter thought it might be helpful for me to brush up on the skills needed to be successful with the use of Social Media in regards to my marketing strategy in order to sell my books. If you are a regular reader of Review This, you are probably aware that I published my first Cozy Mystery novel in October of 2017. Then in November I published my second book in the series. It isn't like in the past when if you were lucky enough to find a publisher for your books who offered you a contract. Back then if you were a writer with a large publishing firm, they did a lot of the marketing for you. A lot of us have gone the self-publishing route which means that all of the marketing is up to us, the author. Even if we had a big name publisher we would need to market our own work. Most publishing companies of today only spend their advertising money on well known authors (who kind of don't need it but that is another topic all together!). Those of you who know me probably think that I probably already understand how to use social media because this isn't my first rodeo with a writing gig. I might have published my first fictional work but I've been around the block several times when it comes to promoting my online writing ventures. I do understand the basics of social media and use it regularly but I will admit not to its fullest potential. The game is different for authors in particular and let's face it...the way to use these social networks changes on a regular basis. How many times have you reached a point where you feel that you have figured it all out, to have one or two of the popular sites change the playing field? I'm guessing a lot! So, I really appreciate my daughter gifting me this book! I'm reminding myself of the basics while being able to come up with a strategy for my writing and promotions. What I like about this book by Tee Morris and Pip Ballantine is that it is written in an easy to understand format. As I said, I'm not new to social media but even if I were the content would be easy to understand. They do a really good job of explaining how each option works and best practices for a writer to use on each platform. They cover blogging, podcasting, Twitter, Facebook, Tumblr, Google+, YouTube, Pinterest and Instagram. Do they recommend that you try to use all of them? Actually, no. They understand that if one were to try to have a solid presence on all of them; there would be no time for the actual writing of the books. They suggest that you pick the three that you are most comfortable with and go from there. As I am studying this book, I feel confident with their advice. They are both authors in their own right and I can tell by the content that they actually use social media to promote not just this book but a series of books that they have co-authored together. I don't know about you but for me that is huge. I'm sure that you have experienced the same as I have over the years with getting advice from a so called expert who has less experience than you do when the dust all settles. I really like that the authors break down the formats and give realistic time frames for using them. Having experience with most of these social media networks, I can tell that they are giving good information on the time that can be invested in working with the different options. They are even honest about having invested a lot of time on a few of them and figuring out that for their needs and their time constraints, it wasn't worth it. That doesn't mean that you will come to the same conclusion because we all have different styles and comfort levels. I do appreciate their honesty in the results for themselves! Now, I realize that not all of you are planning to write a novel or a work of non-fiction; that being said I do know that many of you have a strong online presence either contributing here on Review This or your own sites. Perhaps you contribute on another multi-user site. My point is that much of the information will be beneficial for your online work as well. I know in the past, I have tried to have a presence on all of the social media sites. It doesn't take long to get burnt out trying to keep up. 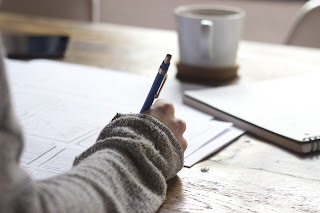 Reading a book like Social Media For Writers is helpful in reminding us of what it is we want to accomplish and the audience we are trying to reach. This book gives some realistic advice on coming up with a strategy that is not overwhelming and that with the proper effort put forth should offer a successful result. It is not going to happen overnight but with dedication and a good plan, it can happen. I am finding this book very helpful and I think that many of you will, also. I know I am changing my strategy after having read it. I am going to concentrate on three platforms and not worry about all of the others. How about you? If you were going to limit your marketing to three platforms, which would you be willing to invest your time in? There are several reasons why you might want to redirect a blogger url to a custom domain url. In my case, I didn't want to transfer all of the articles on blogger to a new site just to have the custom domain url. Custom domains are easier to remember since they most often match the site name. They also don't require readers to remember the "blogspot" part of the url. It is so much easier to tell friends, family, and readers to visit ReviewThisReviews.com than it is to tell them ReviewThisPersonalReviews.blogspot.com. Now that our site has been redirected, either the old url or the new custom domain url will land you here. Even though we have owned the custom domain name for years, I was hesitant to make the redirect. I feared all kinds of evils would befall us. I worried that we might even be offline for hours or days. All of those concerns were unfounded. Nothing bad happened and within 30 minutes, our custom domain was completely set and our site was redirected. 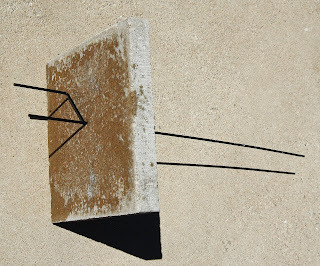 Now, let me share our extremely easy directions for redirecting a blogger site to a custom domain. These instructions are written with bloggers in mind, not computer web designers. The instructions are written in plain, easy to understand English and I have included lots of screenshots so you can see exactly what I am talking about in each step. If you follow these instructions, they will work. Some steps may require waiting time for the DNS settings to activate, but that does not mean you have made a mistake. Simply be patient and allow the internet to process your commands. 3) Click the link "+ Setup a 3rd party URL for your blog"
4) Go to the Namecheap Dashboard and click "Manage" by the url you wish to use, then select "Advanced DNS" from the top tabs. 5) Copy the domain url, go back to the blogger dashboard, and paste the domain url in the box. BE SURE TO START THE DOMAIN URL WITH www. 6) Click Save - This will auto-populate the information you need for the next step. 12) Once saved, confirm the new domain url is working by viewing your actual blog. Look at the address to confirm url change. 13) One last VERY IMPORTANT STEP! You are done, so go Celebrate!!! You may also enjoy seeing our new Quick View Home Page here on Review This! This page features articles you may have previously missed, while also providing excellent examples of the types of reviews published on our site. I will be sharing instructions on how to create your own Quick View Home Page for your blog soon. 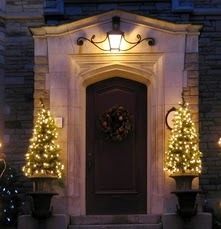 Wouldn't we all love to put some fun back into our holiday preparations? Here are tips to help you do just that. Remember those days as a kid when the holidays were all about excitement, anticipation and just plain fun. It's time us grown-ups got to enjoy that as well. Skip the crowds, the traffic, the lines and the surly salespeople. 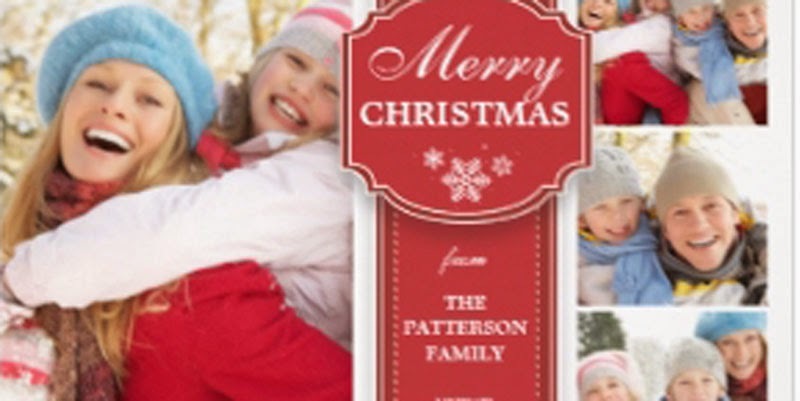 Shop online for just about everything you need from holiday decorations to gifts. The contributing writers for Review This put together a great holiday gift guide just to help you do that very thing. curled up in your pj's and fuzzy bunny slippers. Just do it online. Christmas Time Treasures has lots of those great pages to help you with holiday decorations for your home, like pre-lit Christmas trees, festive kitchen towels, even holiday cats on decorative pillows (www.web-surfing-with-susan.com/christmas-cat-throw-pillows). Get your Christmas tree decorated with personalized ornaments or something even more fun like Eiffel Tower ornaments (www.web-surfing-with-susan.com/eiffel-tower-christmas-ornaments). Holidays are definitely easier and much more fun when you shop online from the comfort of your own home. Since you won't need to spend many extra hours fighting the malls and the traffic, use that time to relax and do something you love. For me, it's a long hot bubble bath with festive scented soaps (www.the-bubble-bath.com/get-in-the-holiday-spirit-with-a-festive-bubble-bath) and reading a great Christmas mystery book (www.mysterybookworldlive.com/holiday-mysteries/christmas-mysteries). Now, we're talking relaxing. Whatever you like to do to relax, do it. Your own holidays will be more fun. More like those days when you were a kid and the whole month of December was all about the excitement, anticipation and fun. Seven years ago I bought a new home that was about 70 percent complete. Part of the 30 percent that remained to be finished included flooring in two bedrooms, the upstairs loft, a half bath, pantry, laundry room, and stairwell. To make the house immediately livable, I put in some flooring that was trendy at the time. I figured if a product passed the Divine Design test of my HGTV guru, Candice Olson, it was certainly more than worthy of installation in my home. I’m still happy with most of the flooring I installed, but I have since rescued a dog. Anyone who has cared for larger dogs knows they can be hard on flooring. The area that has taken a beating is the stairwell landing where Toby likes to hang out by a picture window that gives him a place to keep an eye on what’s happening in our world. I need to install a tougher material that can take heavy traffic. Having decided on tile, since my animals love to soak up the sun in front of that window, I have been researching DIY options. 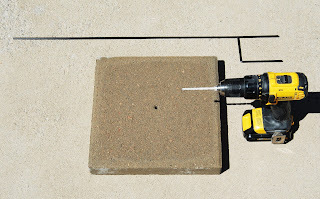 How I love to come across web pages that show an innovative home improvement product in action. There are many websites pushing products, but few that are exceptional when it comes to demonstrating an actual installation. I appreciate a how-to presentation that is honest in sharing what went right as well as lessons learned. Here’s one of the best Squidoo lenses I found. 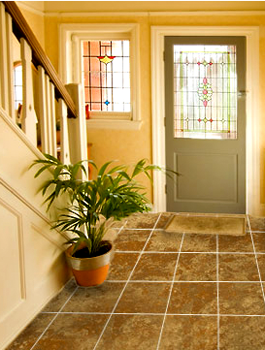 KateHon demos a fabulous floating tile flooring option while sharing before and after photos of a bathroom renovation. I can see myself installing this tile floor in my home. How about you? Have you published a home improvement product review? If so, stop by and let me know. I hope to feature your work. You can find me at Home Renovation Central and "Do or Di DIY."